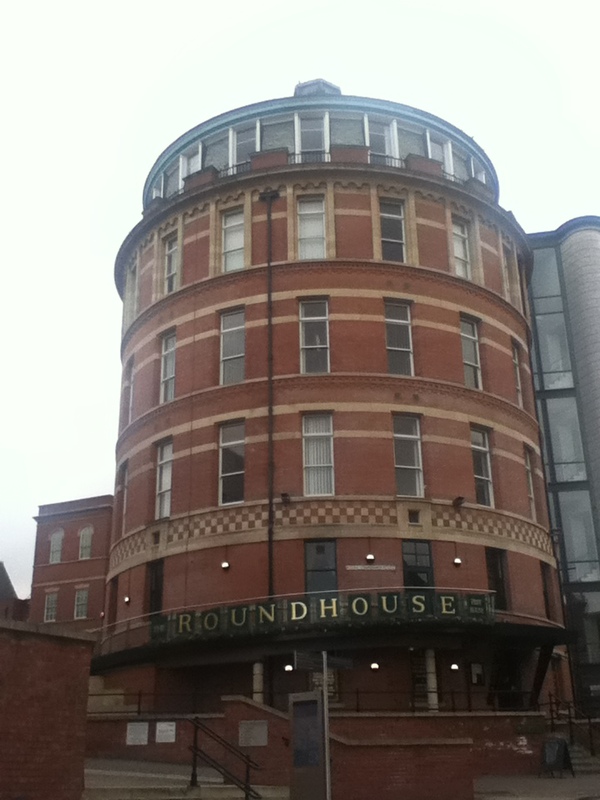 The Roundhouse in Nottingham, located close to the grounds of Nottingham Castle, is well named as it is, unsurprisingly, a large round building. According to their website the pub and restaurant is housed in what was once Nottingham’s Old General Hospital Jubilee wing. Once inside you would never have guessed as to it’s former life. As you enter you have to walk up a winding staircase to reach the bar area which is rather nicely broken up into three different styled sitting areas. By the entrance are a whole set of sofas, settees, couches and leather clad arm chairs. It has that feel of a gentleman’s club. I have sat there on a number of occasions supping on one of the many excellent beers that there serve here. Just around the corner from here (but bearing it mind it is a ’round’ room so technically I suppose there are no corners) are a load of more formal dining type tables, and along the curve of the window, set slightly above the main room, are a set of booths from where you get a good view of the outside paved patio. In warm weather you can also sit outside. We chose to sit up in the booths, the best seats for eating and drinking in my opinion, plus you get a good view of the rest of the pub from up there. There is a really excellent sounding list of options on the menu, but in the end after a little discussion it came down to three choices, the “Marinated Minted Lamb Chops”, the “Venison Burger” and the “Chicken and Smoked Bacon Wellington”. I had already spotted those on the sample menu online and really had it in my mind to get the Wellington. So I did. My companion chose the Venison Burger, I would have had that but had one a few weeks ago at the Canal House so I passed this time. I was expecting something slightly smaller and perhaps more dainty on the plate. A little pastry wrapped wellington, a small selection of vegetables and a handful of chips. However as you can see what I actually received was a huge substantial plateful of food, and I can tell you that I was not disappointed at all. 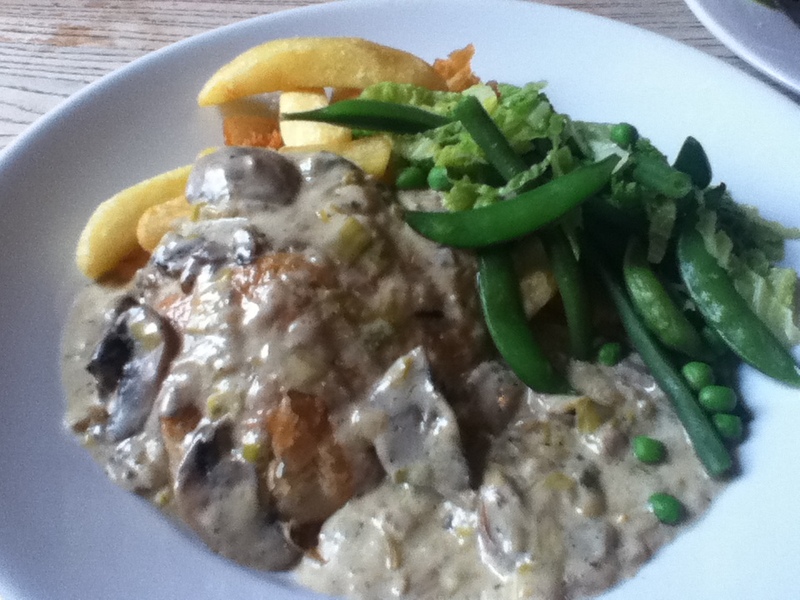 The Wellington was hidden beneath a rather nice creamy mushroom and leek sauce. The pastry was a little bit soggy as the sauce had soaked into it, but I did not mind that at all. The Chicken breast inside was really juicy still and perfectly cooked. 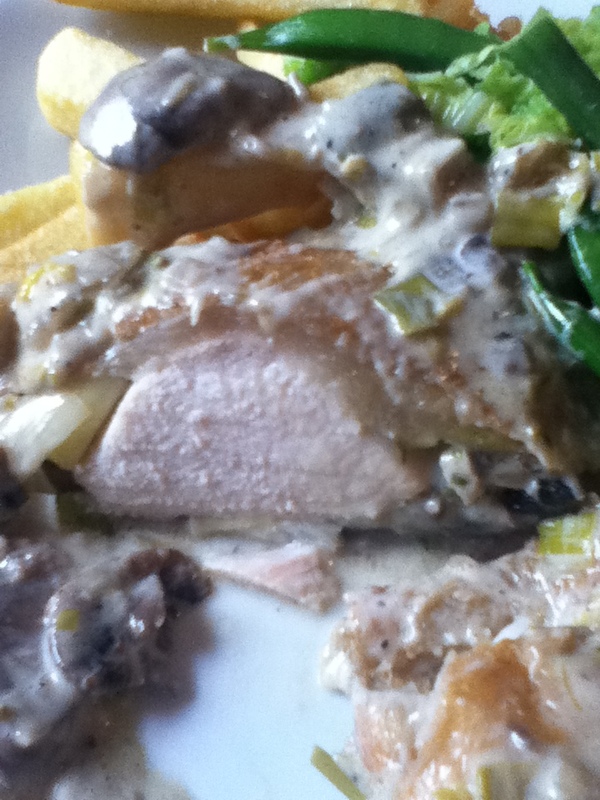 There was a really tasty layer of smoked bacon on top of the chicken just beneath that soft pastry casing. A pretty damn good Wellington. Putting the Wellington to one side to focus on the rest of the dish, they really were not joking when they said it was served with a ‘Green Vegetable Medley’ there were peas, shredded cabbage, French beans and sugar snap peas, the broccoli was the only one not invited to the party. The mushroom and leek sauce was I have already said nice and creamy, in all honesty you could just add this sauce to some pasta and you would get a decent meal that I would have been happy enough paying for. The last things on the plate were the chips, these were really good chips, nice crisp coating with a soft fluffy potato filling. Very good indeed. 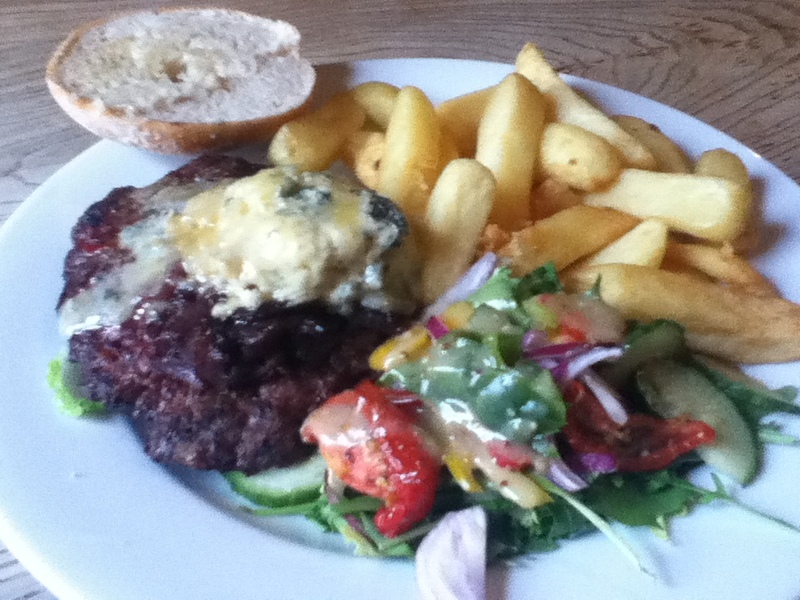 The Venison Burger arrived topped with a good thick layer of Stilton, Red onion and a good spread of chilli jam. It looked to be a good home made patty served up in a somewhat undersized ciabatta roll that the burger poked out of at each side. To be fair I prefer to get more meat than bread so that was not a bad thing. Cutting into the burger it was still a little pink inside, so just about perfectly cooked. It was accompanied by a very interesting looking rocket salad and some of those same excellent chips that came with the Wellington dish. The Burger verdict was very positive and one worth returning for. At lunchtime you can get sandwiches and salads from their deli counter. Of the salads I quite liked the sound of the ‘Sauté New Potatoes, Spring Onion, Mint & Apricot Crème Fraîche‘ and the ‘Roasted Red Pepper, Courgette, Aubergine Cous Cous , Coriander and Lemon’. The sandwiches also sound pretty tempting as well, the ‘Fresh Fish Finger, Rocket & Homemade Tartar Sauce’ and the ‘Honey, Lemon & Wholegrain Mustard Chicken with Sauté Peppers & Onions’ both for £5.95 caught my eye. You can view a sample of the menu options on their website. 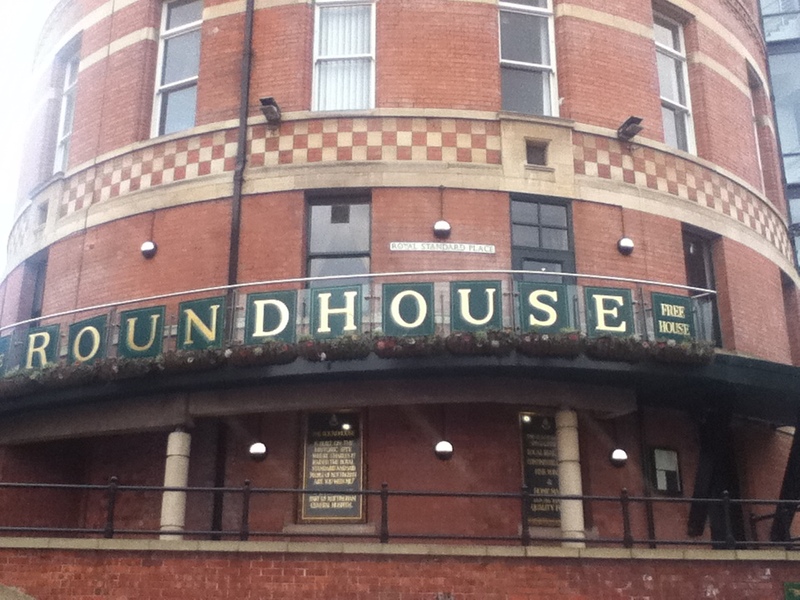 The Roundhouse does not just have an interesting, well balanced and reasonably priced selection of food on it’s menu, it also has a pretty good selection of well kept beers as well. On this occasion I was sampling a couple of pints of the excellent Deuchars IPA, but they also have beer from the Dancing Duck Brewery which I can also recommend. The Roundhouse is located close to the Park estate and not more than a minutes walk up the hill from the entrance to Nottingham Castle. Travelling here via the tram it is about 5 minutes walk away from the Old Market Square tram stop which is the closest.